There are several ways to approach a meditation practice. From reading a book, to learning from a teacher in-person, listening to audio recordings or downloading a mindfulness-based app like Headspace or 10 % Happier. Regardless of your in-roads to the practice, and no matter the style of meditation, I have consistently noticed that there is one step any and every new meditator must take. This step is all about laying the groundwork and creating stability in order for the mind to be able to meditate. As mentioned in a previous 'Arriving Home', stability is something that we cultivate across several areas in our practice. It's important to have stability in both your body and mind in order to really meditate. Stability is also necessary to grow mindfulness. Mindfulness is unable to be fully realized if you are moving every 5 minutes in your meditation, allowing your attention to be completely carried away by thoughts or being cavalier about bringing your attention back to the breath after it has wandered away. The basic truth is that stability is a step-wise process. Once the body finds stillness, only then can the mind find stillness too. So, with keeping a relatively comfortable yet still body in your practice, you then want to support the mind in creating steadiness and stability. This is the gateway to happiness, calmness and the ability to deepen your awareness. Concentration is key to the mind becoming steady, clear and stable. You may think that concentration requires too much effort and isn't fun. Regardless, concentration creates the foundation for your mind to relax, open and expand, making it absolutely essential to your practice. Counting: Again, you may feel a little resistant to the idea of counting during your meditation practice. You may be thinking, "isn't meditation supposed to be relaxing? 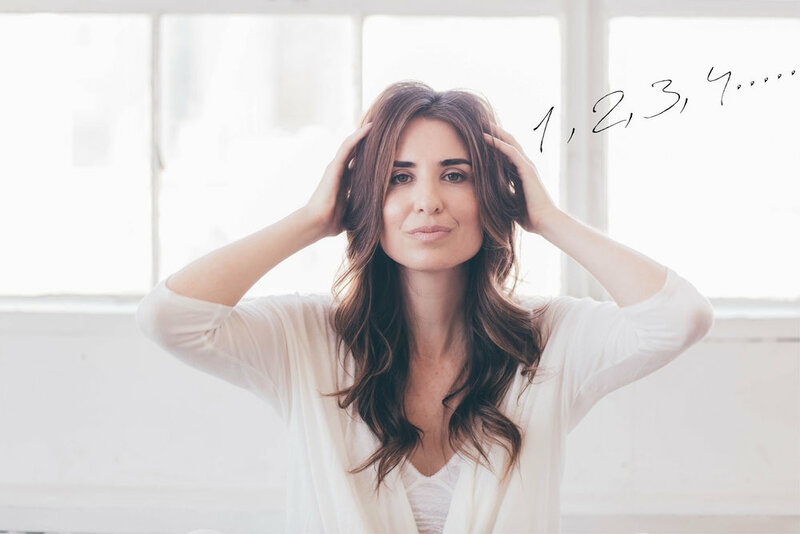 Counting seems so rigid..." THE BIG SECRET is that if you have yet to create a foundation of stability in the mind, or if you feel like you are struggling to meditate, then your mind is going to LOVE counting. Most likely, you will find counting to be a very relaxing experience for your mind. For the moderately active mind: In this counting technique, you silently count "1, 1, 1" on your inhale and "2, 2, 2" on your exhale, "3, 3, 3" on the next inhale and "4, 4, 4" on your next exhale. Repeat this all the way up to 10 and then begin again at 1. For the anxious mind: This counting technique quickly and mindfully zaps any anxiousness you are feeling because of over-thinking. (You know, the times when you meditate and you just can't seem to stop thinking no matter how hard you try. Or you keep thinking about all of your stressors and difficulties... and problems.) During your inhale, quickly count "1, 2, 3, 4, 5" all the way to 10. And on your exhale count "1, 2, 3, 4, 5" all the way to 10. You count 1-10 during each inhale and exhale. For a mind that needs just a little support: This has been my go-to counting technique for years. I have found it to be the little extra nudge my mind needs in order to get into a really lovely deep-concentrated state. This is for a mind that is already relatively relaxed, but just needs a bit more focusing during that particular day's practice. Count "1" at the end of your exhale, and then "2" at the end of your next exhale, "3" at the end of the next exhale, all the way to 5. In this technique, you only need to count to 5, allowing a full cycle of breath between each count. Concentration is not only the quickest way to create stability in the mind, but you will also find that concentration makes the mind really happy. It tends to produce a pretty strong "bliss state" in your meditation and leads you right into a deeper level of awareness. It's important to note that you only need to use a counting technique to stabilize your attention with the breath. Once you have found a level of concentration with the breath you can stop counting and simply follow the breath for the rest of your meditation. You may also find that you go between counting and breath awareness like a fluid dance. This is why counting can be so supportive for the mind - it's like the bridge leading the mind back home to the breath each time it is having a hard time during meditation. My hope is that you give your mind the opportunity to become nice and concentrated, so you can create a solid foundation of stability in your practice from which your mindfulness will grow. Stay concentrated and keep with the countdown. For more reading on these counting techniques and others, click here.